Muslims for 9/11 Truth: Yahoo News: "Ahmadinejad 1, Couric 0"
Yahoo News: "Ahmadinejad 1, Couric 0"
After expressing his regret for the loss of life, Mr. Ahmadinejad pulled out a photo of another woman. He showed it to Ms. Couric and asked if she knew who the woman was. Couric said she didn't, and that's when Ahmadinejad pounced. 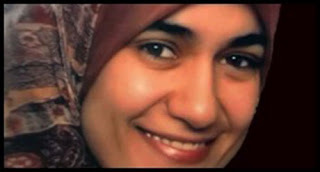 Ahmadinejad explained that the woman in the photo is Marwa Ali El-Sherbini. She was stabbed to death in a German court by a neo-Nazi. The Iranian president then asked why the death of Ms. El-Sherbini wasn't being publicized by the media in the same way as Neda's. Ahmadinejad "suggested that the western media — who turned Neda into a martyr — ignored Marwa's story."